I used to manually choose the tracks to sync to my iPod Nano, but now I have 7-something gig to play with on the iPhone, it’s a bit too much. 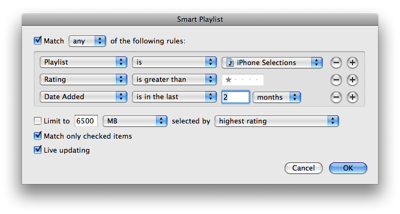 Instead, I use smart playlists to select which tracks to carry with me. Watch that ‘any’ selection in the top drop-down – a bug in iTunes resets it to ‘all’ every time you bring up the dialog, so you gotta reset it every time. That makes sure that tracks I manually choose are copied over, and the rest is automatically selected by rating and the date added (ideally). Ratings, of course, are automatically set using AutoRate. The one caveat is that because you can’t select more than one sorting criteria when limiting to a certain filesize in the smart playlist, you can just choose either to sort by add date – which means you’re guaranteed to get that great new album copied over – or by rating, so that you’re gunna get the best tracks. Not both, unfortunately, unless you limit the ‘iPhone Inclusions’ smart playlist too (but that means you won’t necessarily fill up the iPhone if you have lots of exclusions that would otherwise be included). Other than that, it works quite well – I haven’t yet had a moment when I’ve missed anything on the iPhone. iPhone, Mac, Software. Bookmark the permalink. Both comments and trackbacks are currently closed. I try to make the best of playlists and smartplaylists in filling my iPod/iPhone up but never manage to get anything I am happy with. After trying this, I must say my iPhone is now filled with music goodness!